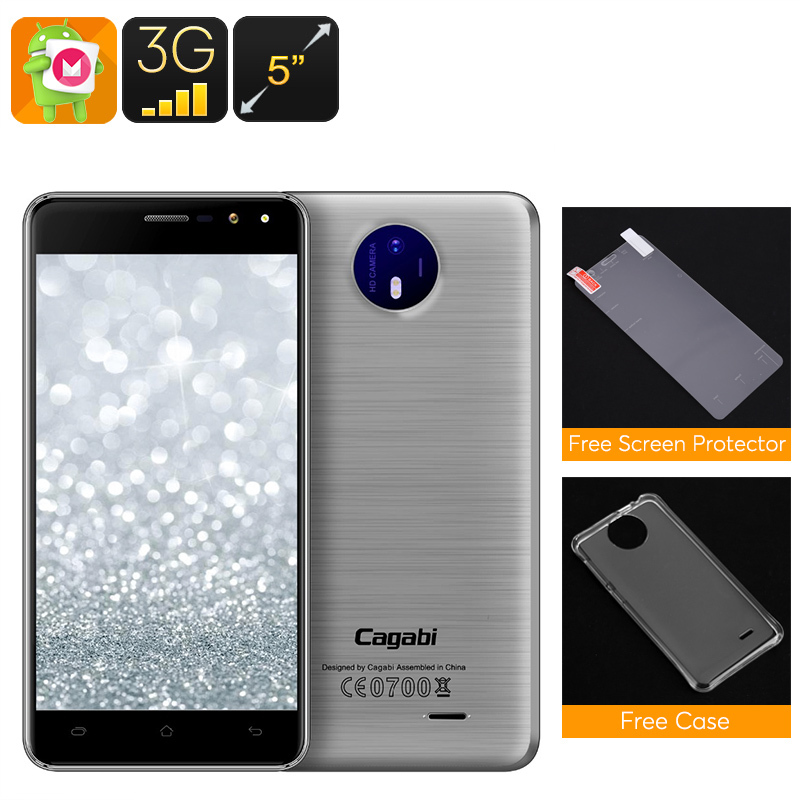 Successfully Added Cagabi One Android Smartphone - Android 6.0, Quad-Core CPU, Dual-IMEI, 5-Inch HD Display, 3G, 8MP Camera (Silver) to your Shopping Cart. For those of you that are looking for a cheap smartphone that functions perfect for children or as a back-up holiday phone, the Cagabi One has an answer to all your demands. This affordable Android phone is available for less than 50 Dollars and provides you with all the basic smartphone possibilities. Make calls, send messages, browse the web, play non-demanding games, and make pictures – you’ll be able to do it all. Thanks to its 5 Inch IPS display, this Android phone provides you with a great platform on which to enjoy your favorite media and all the phone’s features in HD resolution. Running on an Android 6.0 operating system, this cheap smartphone allows you to efficiently use up to date software features thanks to which it provides a smooth experience. The phone furthermore features a Quad-Core processor from Mediatek and 1GB of RAM that lets you enjoy basic smartphone features as well as non-demanding games and video without dropping a frame. Access to the Play Store provides you with an easy way to download mobile entertainment and 32GB of external memory offers enough space to store all your latest acquired media and files. The Cagabi One is a cheap 3G smartphone that offers Dual-SIM card slots and two IMEI numbers. Thanks to this, you’ll be able to be connected to two 3G network providers and be reachable on two phone numbers simultaneously. A 2200mAh battery is in place to allow you to make non-stop calls for up to 2 hours. Additionally, the Android phone packs an 8MP camera to snap nice photographs of your upcoming holidays and daytrips.